...over 350 pages show the tireless advocacy for UFOs by Admiral of the Fleet Peter Hill-Norton, a former Chief of Defence Staff and a peer in the House of Lords until his death in 2004. The recent release of UFO files from the UK’s Ministry of Defence (MOD) include two files, DEFE 24/2033/1 and DEFE 24/2034/1, dealing with Parliamentary Questions. A substantial amount of these—over 350 pages—show the tireless advocacy for UFOs in general and the December 1980 incidents in the Rendlesham Forest near the RAF bases of Woodbridge and Bentwaters in particular, by Admiral of the Fleet Peter Hill-Norton, a former Chief of Defence Staff and a peer in the House of Lords until his death in 2004. Because of his senior military rank, his parliamentary position and his stubborn personality that wouldn’t take ‘no’ for an answer, Lord Hill-Norton was a formidable foe to the MOD bureaucrats trying to spin and minimize the significance of UFO incidents over British airspace. The people at MOD knew this, as shown by the amount of drafts with careful editing in their official responses to the various UFO questions raised by Lord Hill-Norton. However, this never seemed to satisfy him and the exercise was repeated over and over again. Before describing some of these PQs and PEs, let’s take a brief look first at the illustrious military career of Admiral of the Fleet, Lord Peter Hill Norton, and why he was able to intimidate so many government officials regarding the UFO issue. Although he certainly never used the term, Lord Hill-Norton was practicing—particularly during the last years of his life—exo-politics, raising the issues concerning UFOs and possible ET intervention in the realm of politics and government. 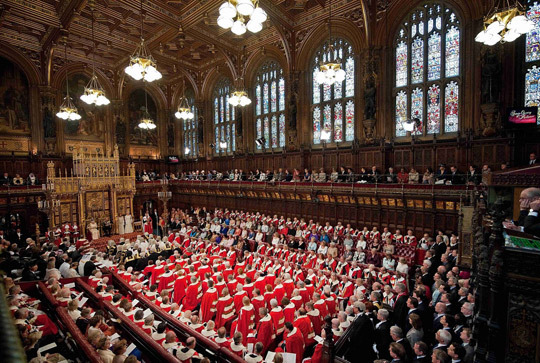 The Queen Addressing the House of lords in April, 2011. Peter Hill-Norton was a fierce, ramrod-backed naval officer of the old school. An aggressive, diminutive character, he was lean and fit throughout his life, his piercing blue eyes missing nothing and striking terror into the hearts of his subordinates. Ruthlessly ambitious and never afflicted by false modesty, he rose to become Chief of the Defence Staff before ending his career as Chairman of the Nato Military Committee. Hill-Norton was a ferociously hard taskmaster, but he also sought perfection in himself and devoted his formidable intellect and boundless energy unstintingly to the Royal Navy’s cause. Peter Hill-Norton was born in South Africa in 1915, the son of a pilot in the then brand new Royal Flying Corps and, on his mother’s side, a family of naval officers going all the way back to 1635. He entered the Royal Navy as a cadet in 1928 and served as an officer in various ships in the Far East and Pacific Fleets during World War Two, being promoted to Lt. 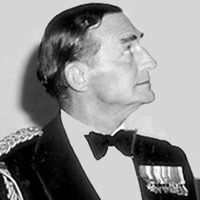 Commander in 1944. His military career continued to climb rapidly: in 1957 he was appointed Director of Tactical Weapons and Policy at the MOD; after commanding the aircraft carrier Ark Royal, he was promoted Rear-Admiral and appointed Assistant Chief of Naval Staff in 1962. The titles kept coming: Commander-in-Chief Far East, 1969-70, Chief of the Naval Staff and First Sea Lord, 1970-71, Chief of Defence Staff, 1971-73, and his final crowning military post, Chairman of the Military Committee of NATO, 1974-79. After retiring from military affairs, he was made Baron Hill-Norton in 1979, becoming a peer in the House of Lords. While there is no evidence that he was at all involved with UFOs during his long military career, the issue of the day was then the Cold War and its ramifications throughout the world, he became acquainted with ufology as soon as he entered the House of Lords. Shortly before he joined this august body, there was a famous four-hour debate on UFOs on January 18, 1979, convened by the Earl of Clancarty, the well known British ufologist and author Brinsley Le Poer Trench, who passed away in 1995. Following the debate, Clancarty formed the House of Lords All-Party ‘UFO’ Study Group, which functioned through the eighties and where Hill-Norton had his apprenticeship in ufology. This was not an official committee but an informal study group which invited speakers, both British and foreign ufologists, to address the group. It was during this period that Lord Hill-Norton struck a close friendship with famous author Timothy Good, writing the foreword to his bestseller Above Top Secret: The Worldwide UFO Cover-Up and for a couple of his other books. Later on, he also cooperated with author Georgina Bruni, who published in 2000 a massive book about the Rendlesham affair titled, You Can’t Tell the People. Many details and documents contained in this book became the source of some of Hill-Norton’s Parliamentary Questions about this famous case and the shortcomings of its official investigation by the MOD. I do hope that you will be successful in opening this very stubborn oyster, even if you could get it half open it would be a great step forward. You will know better than I what the chances of “hearings” may be, but it seems to me that they will not do the trick unless the President can be persuaded to issue “immunity certificates” (if that is the right term) to several of the key witnesses. The bulk of the latest MOD UFO papers released dealing with Lord Hill-Norton are contained in the two DEFE files on “Parliamentary Questions.” I am not an expert on the British political system, but the way I understand it is that at any given time there is a member of the House of Lords with the rank of Under-Secretary of State for Defence, who deals with all military issues, including the unwelcomed UFO child. 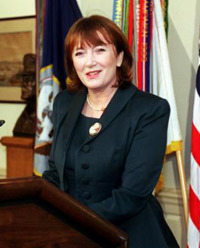 The current batch contains copious correspondence with three of these Under-Secretaries from the Labour Party: Lord John Gilbert, who served in the House of Lords as Minister of State for Defence Procurement, 1997-99, during Tony Blair’s administration; Baroness Elizabeth Symons of Vernham Dean, Minister of State for Defence Procurement, 1999-2001; and Lord William Bach, Minister of State for Defence Procurement, 2001-05. MOD answers to Lord Hill-Norton. Click on the image to read them all on PDF. 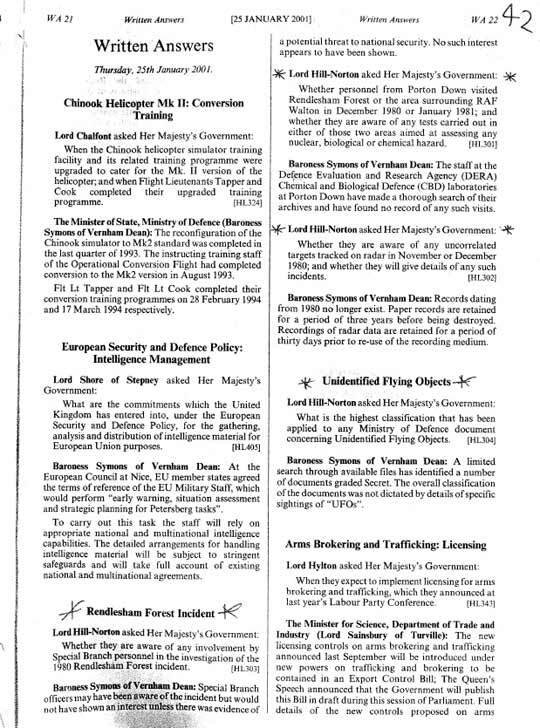 No additional information has come to light over the last 20 years to call into question the original judgment by the Ministry of Defence that nothing of defence significance occurred in the location of Rendlesham Forest in 1980. Accordingly there is no reason to hold an investigation now. 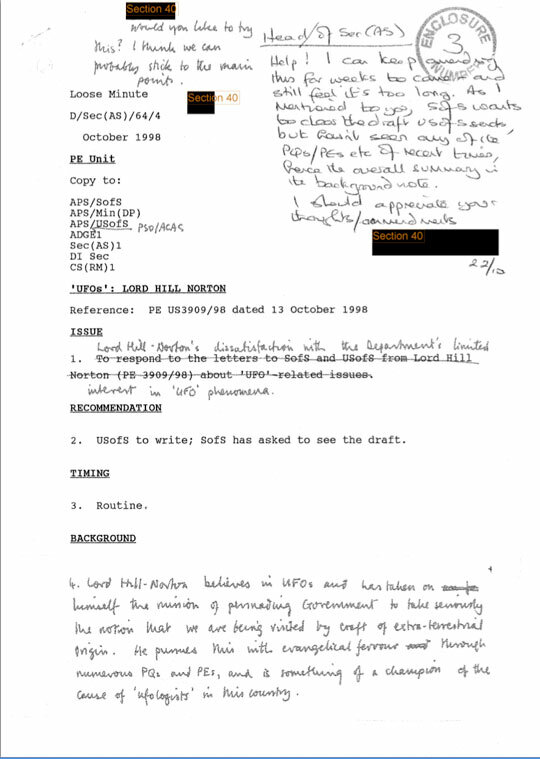 We include also the MOD’s “Background Note” following the “Written Answers,” as it shows the techniques and methods used by the Ministry in dealing with these types of parliamentary enquires. 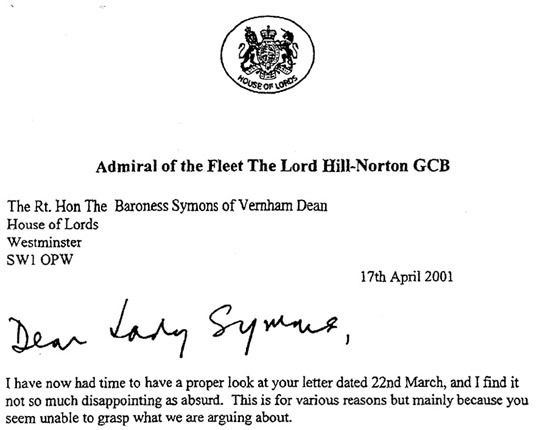 The bottom line is that the party line of “nothing of defence significance” drove the Admiral of the Fleet mad and in one particular letter to Baroness Symons he really lost the polite language you would expect from a peer in the House of Lords. He hits the tone right at the beginning of the letter to Lady Symons, dated 17 April 2001: “I have now had time to have a proper look at your letter dated 22nd March, and I find it not so much disappointing as absurd. This for various reasons but mainly because you seem unable to grasp what we are arguing about.” Click here to read Lord Hill-Norton’s letter to Baroness Symons. Lord Hill-Norton's letter to Baroness Symons. Click on the image to see the entire letter in PDF. Either of these simply must be “of interest to the Ministry of Defence”, which has been repeatedly denied, in precisely those terms. They, or words very like them, are used again in your letter and I believe, in the light of the above, you would not feel inclined to sign your name to them again. Whether they are aware of reports from the United States Air Force personnel that nuclear weapons stored in the Weapons Storage Area at RAF Woodbridge were struck by light beams fired from an unidentified craft seen over the base in the period 25-30 December 1980, and if so, what action was subsequently taken. Following reports of smoke being seen at Benaughlin Mountain, near Kinawy on the afternoon of 13 February 2001, police and troops conducted a search of the area, assisted by a helicopter, but nothing was found. A further search was carried at the following morning but nothing was found to indicate a downed aircraft or a fire and the incident was closed. The MOD files include the police reports of this little known incident. You can consult the DEFE 24/2033/1 and 24/2034/1 files on “Parliamentary Questions” at the UK’s National Archives here, but bear in mind that the files can be downloaded free only for a limited time, afterwards you have to pay a fee. 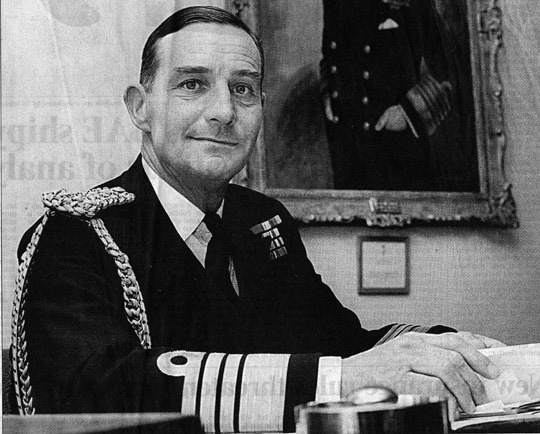 For a full military biography of the admiral, including his interest on UFOs and friendship with Tim Good, you can read the obituary in the Navy Days website here (link has been removed by source). There is no doubt that the Admiral of the Feet, Lord Hill-Norton, was a formidable advocate of the UFO cause and that nobody replaced him in that role after his passing in 2004. Nevertheless, his tireless efforts can now be studied and celebrated by all those interested in ufology not only in Britain but anywhere in the world, where there is a dire need for more leaders like him in political circles.